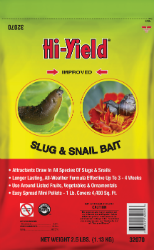 A very effective and easy to use Slug and Snail control. Formulated to attract Slugs and Snails, then paralyze them until the sun dehydrates them and they die. Longer lasting all weather formula effective up to 3 to 4 weeks. Use on vegetable gardens, fruit trees, berries and turfgrass lawns. Application Rate: Sprinkle a ring of pellets around affected plants. 1 lb. covers 4,400 sq. ft.